Let’s talk durability, reliability, and budget. As with most things, people will want a knife that will hold up, work consistently, and not break the bank. There is a fine line when it comes to knives. Often you sacrifice a lot of quality as you go down in price, especially once you throw in the added cost and benefit of a spring assist. If you are using a knife as an EDC, then you probably don’t want to spend a lot because of the high chance that you may lose your knife as you go about your day. Clips will catch on couches, corners, pretty much anything that you may brush up against and will either break (which will make you mad) or pull the knife out of your pocket without you realizing it (which will make you furious). 1) I like the weight because generally if the knife feels like it is heavy duty, then it generally is heavy duty and can withstand some abuse. Not that I condone the abuse of knives, I just like to think in the “just in case” mind set. 2) I like to be able to feel that I have a knife sitting in my pocket. If I forget my EDC, or grab a knife out of my drawer that is smaller / lighter than the ones I usually carry, I am either off balance, or I consistently slap my pocket to see if my knife is still there. 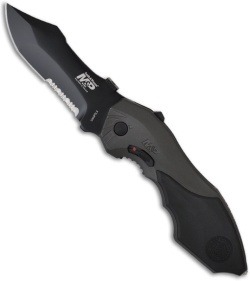 Smith and Wesson spring assisted knives are great for those of us that like a durable, hefty knife and don’t have a lot of extra spending cash to go crazy on. Specifically, the Military and Police, or for short, the SWMP series. I love this series; they will come in a variety of blade styles and handle designs to fit individual tastes and styles. The unifying attributes however are the big sell points for me. 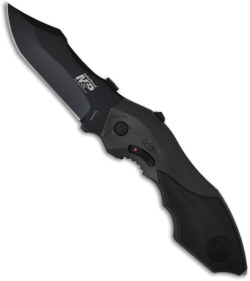 As you can see there is a lot of variety of styles, but there are many more reasons why the Smith and Wesson Military and Police line are great knives. First, they have the innovated “auto” flipper system. My favorite style of knife is the flipper, which means that there is a stud on the back of the knife that you pull and the knife will open. 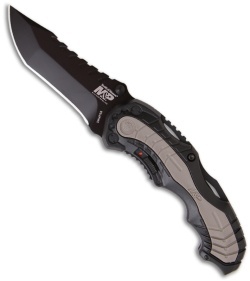 The SWMPs are all spring assisted, so simply pull down on the tab and the blade will take over. Second, they all have a sliding safety with a convenient red dot that lets you know that the knife is ready to open. This way your knife won’t accidentally flip open as you slide your knife back into your pocket, yay for safety! Third, they all come with a glass breaker (except for the model 6). Hopefully there never comes a time when you would need to break a car window, but if there is a time when you would need it, it’s a good thing that it is located on your EDC. Just don’t forget that it’s there! The SWMP series is a solid budget carry line up. Take some time to look them over and decide which style will fit you best. For me it’s the new SWMP6, even though that model doesn’t have the glass breaker (I usually have something else that will do the trick for me) the new serrations are seriously aggressive. I love the new teeth that they put on those knives. Just remember to search with the term SWMP and you will find all that you would ever need.